That’s the percentage of listening that is now digital. So very close to 50%, but just not quite. But I’ll come back to that shortly. 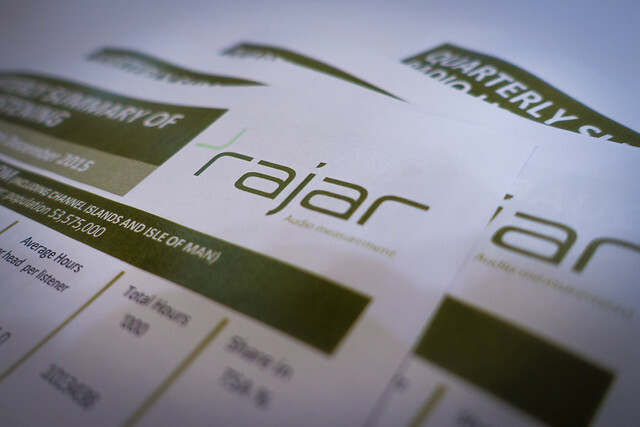 These are a few thoughts on the final RAJAR results for 2017 that are now in, representing the period up to and including 18th December 2017. Overall radio listening remains at 90% of the UK population listening at least once a week, listening for over a billion hours cumulatively. Those listening hours are down a small amount however, falling 0.9% on the year. For the record, the mean age of a radio listener is 48 (up from 47) a year ago. But averages are something of a brute instrument to measure listening, particularly when you consider that the population is ageing. A more useful measure is to look at the number of hours age groups listen to over time. The chart below compares listening by age demo over the last five years, comparing similar quarters. In general terms the story isn’t too bad, with the notable exception of 15-24s for whom there is a clear downward trend. The reach for this demographic is down to 80.3%, the lowest it has ever been. This is a “problem” group for radio. Earlier this evening I attended an interesting event organised by the research and analysis company MIDiA, exploring radio in a streaming world. One of the metrics they talked about was the number of listening events people have during the week. While MIDiA’s research compares radio to streaming services which isn’t something that RAJAR allows, RAJAR does let you explore what’s happening with listening events. This chart is another good way to explain things. What it shows is the number of different listening events someone has in the course of a week. While a given listening event might be just a few minutes, or conversely many hours, the number of times someone turns to the radio is a decent indicator about how radio is doing as a medium in someone’s life. I’ve just compared 15-24s with all adults in the above chart, and you can quickly see that there is a decline in the number of times the average 15-24 year old turns on the radio over a relatively short period of time. It’s now less than twice a day. The all adult number is steadier, but the key here is to make it easier for that number to be bumped up, and that will be the challenge radio has to face up to. Can smart speakers introduce more listening events? But let’s get back to that digital listening figure, as it’s incredibly close to the point whereby half of all listening is through a digital platform. 49.9% is clearly the highest amount of digital listening we’ve yet seen, and I would confidently expect the 50% figure to be breached as soon as next quarter, in the main because I think we’re about see significant growth in radio listening via smart speakers. Google reported selling 6m speakers globally between October and December, many of them heavily discounted. Amazon doesn’t give out numbers, but reported that the Echo was the biggest selling item on its site over Christmas. A lot of speakers were sold, and these make very convenient voice controlled radios. That’s why I think we’ll get to 50% digital listening as soon as the next quarter. But it is also true that these speakers make listening to services like Spotify also much easier. So there’s give and take there. If you dig a little further into the digital figures, then you find that commercial radio is ahead of the BBC in going digital. Commercial radio is 51.6% digital compared with BBC radio at 48.3%. This isn’t too surprising when you consider that BBC radio is generally older than commercial radio – the average of a listener is 50 v 45 for commercial radio. The older you are, the less likely you are to have switched to digital. Radio 1 had a good quarter this time around, climbing to over 9.8m in reach, representing growth on both the previous quarter and year. Hours spent listening climbed too. The only very slight downside is that the average age of the audience crept up very slightly to 36. But I do think it’s harder to break music listening into age groups as much as would have been the case in the past. Nick Grimshaw also had his best performance at breakfast since Q3 2015, with 5.7m listeners. Radio 2’s results were decent as well, with reach up 0.8% on the quarter and 2.9% on the year. While hours were up a very healthy 3.6% and 4.5% respectively. 190m listening hours is a new record for Radio 2, and represents 18.3% of all UK radio listening. Radio 3 was down fractionally in reach on the quarter, but more so on the year. It was a similar picture in terms of hours, but it’s worth noting that Q4 2016 for Radio 3 was something of a freak result, particularly in terms of hours. Radio 3 also had some schedule changes take place during this quarter. Radio 4 is fractionally up in reach on the quarter and fractionally down on the year. Hours are down 0.8% on the quarter, and a much more significant 8.1% down on the year. But of course, Q4 2016 was a US Presidential election quarter! Radio 4 Extra reported some record figures being healthily up in reach and hours on both the previous quarter and previous year. It reached 2.26m reach and 13.3m hours this time around. Five Live had quite a decent bounce from last quarter, up 7.6% in reach. That’s still 4.6% down on the previous year, but there’s a relatively new daytime schedule still bedding in, with some recent further tweaks that won’t yet have hit RAJAR. Five Live Sports Extra had a small amount of Ashes commentaries in this quarter, although much of the Australian tour will come in Q1. What’s more, there was more summer sport in Q3, so this quarter saw sizeable falls. 6 Music didn’t have a record set of numbers! It was down a little in reach, although up on the quarter in hours. It ticks along very nicely. Classic FM had a really good set of numbers, up 4.4% on the quarter in reach (up 5.7% on the year), and even greater gains in terms of hours. Absolute Radio had a good set of numbers too, with reach up 10.9% on the quarter (up 5.9% on the year) and hours up 5.9% on the quarter (up 16.3% on the year). That represents easily the best reach the station has had since it rebranded as Absolute Radio back in 2008. Hours are also at a record level. Talksport falls a little from last quarter in reach, down 2.2% on the quarter (down 4.8% on the year). More worryingly, hours fell 17.5% on the quarter (down 8.8%) on the year. The only thing I’d note is that there was quite a big swing last quarter, so some of this might be “correction.” The station is benefiting from News UK cross-promotions however, with regular ads to be found in both The Sun and The Times, but I wonder if it needs further refreshment? It’s sister station Talksport 2 remains a little challenged, with reach down 9.1% on the quarter (but up 5.8% on the year) at 311,000. Hours are more stable, but there is still work to be done in establishing what the station really is – since it’s more than simply a spillover station as Five Live Sports Extra is. The last few weeks have seen some big changes in the Talkradio line-up with some significant programming investment going into the station – not least signing up Eamonn Holmes, and moving Julia Hartley-Brewer to breakfast in place of Paul Ross. Of course, we’ll have to wait until next quarter to see the first fruits of these changes. In the meantime reach fell 5.5% on the quarter (down 4.0% on the year), while hours rose 6.9% on the quarter (and more than doubled on the year). The Absolute Radio Network had a great set of figures, closing in on nearly 5m a week across the portfolio of services – a new record. The network was up 4.4% on the quarter (up 3.7% on the year), while hours were up 2.9% on the quarter (up 2.7% on the year). The main Absolute Radio service was the best performer, but it’s notable that Absolute Radio 90s has just won “promotion” to the national D1 multiplex. It’s interesting that Bauer chose not to shuffle the deck a bit and put Absolute 80s back on D1, and put 90s on D2 which has lower coverage. Absolute 80s launched in 2009, and we are now nearly ten years on. Does that mean that 90s is the new 80s, and 80s is in fact what we’d have previously called a “gold” format? I tend to think that Absolute is being quite smart making a play for 90s, as demographics mean that those in their 30s-40s today grew up with 90s music in their teenage years. As for Absolute 80s? Well it’s battling on with Heart 80s, and while it’s still ahead, things are getting tight. Recall that Heart 80s has the better D1 coverage. Absolute 80s fell 3.8% in reach on the quarter (down 3.6% on the year), to 1.47m. Hours fell more down 12.6% on the quarter (down nearly 27% on the year) to 6.4m. Heart 80s is still on a few months old, but it grew 7.4% in reach to 1.17m, while hours grew 25.3m to 6.1m. That means that the station is on course to overtake Absolute 80s in terms of listening perhaps as soon as next quarter. We’ll have to wait and see about reach. That raises some interesting questions about loyalty. It turns out that only 200,000 people listen to both stations, suggesting that there’s more than simply having “80s” in your station name. But Heart does seem to be persuading people to make the switch. Returning to Absolute Radio for a moment, the big question there must be who replaces Christian O’Connell who has recently announced that he will be moving to Australia to take up a new challenge in Melbourne. His reach of 2.1m is second only to Rickie, Melvin and Charlie on Kiss in the commercial radio world, and he’s going to be a tough act to follow. The obvious choice would be Dave Berry who looks to have quickly settled in at Drive on Absolute. But changes in breakfast presenters are always tricky times. Elsewhere in Bauer, the Magic Network performed well with both reach and hours up. The 3.9m reach of the network is a new record for them. The main Magic station is also doing well. Kiss is largely speaking flat on the quarter with only small changes, although it’s up on the year. Kisstory is down in reach and hours on the quarter, but it up on the year. Kiss Fresh starts from a lower based, but it up in reach and hours both on the quarter and the year. Over with Global, the Heart Network saw some falls, with reach down 5.1% on the quarter (down 8.3% on the year), while hours fell 2.9% on the quarter (down 10.2% on the year). There’s a similar story with the Heart Brand which incorporates more than the main network. In London, there’s certainly been some marketing activity recently – I noticed that some of the current bus ads have actually put the FM frequency on them, something that many radio brand ads have shied away from in recent years. But I can’t definitively pinpoint what marketing was done in this quarter nationally. Capital too has a current marketing campaign underway, in London at least, where they are still trying to bed in Roman Kemp on their breakfast show. Nationally, as with Heart, the network is down a bit, with reach down 4.1% on the quarter (down 4.5% on the year), while hours fell 7.5% on the quarter (down 5.0% on the year). Radio X is doing well nationally with its best ever figures. Reach is up 3.7% on the quarter (and up a massive 26% on the year), while it’s also up 11.7% on the quarter (and up 26% on the year). Global has invested heavily here, and it looks to be beginning to pay off for them. LBC is down a little on the quarter, but still up nearly 20% in reach on the year. It seems to have settled at just over 2m listeners a week nationally. Overall commercial radio fell from 45.3% of all radio listening last quarter to 44.2% of listening this quarter. (It’s still up from last year’s 43.9% however). On the other hand BBC radio grew from 52.1% of listening to 52.8% of listening this quarter. However it was at 53.5% this time last year. As ever, London sees a certain amount of movement. Things are tight amongst the commercial stations with Capital London just pipping Kiss for the biggest audience in terms of reach. Capital was down fractionally to 2.1m (although up nearly 22% on the year), while Kiss had a big 8.2% jump to 2.0m reach (up 8.8% on the year). The tables are turned in terms of listening time however, with Kiss coming out ahead of Capital. Kiss actually saw a fall of 7.2% on the quarter (and a rise of 13.5% on the year), showing just how changeable the London marketplace is. On the other hand Capital’s hours fell more, down 9.2% on the quarter (but up 28% on the year!). 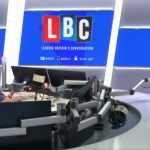 However, LBC still owns the commercial listening crown in London despite also seeing a fall in hours of 7.6% (down 1.6% on the year). Reach was nicely up 9.5% on the quarter (up 15.2% on the year) to 1.2m. Absolute Radio had a decent reach result in London, up 5.0% on the quarter (up 22% on the year), although hours were down nearly 21% on the quarter (up 22% on the year). The other station to note in London is Radio X, with its strongest London performance since it rebranded from Xfm. Reach grew 6.5% on the quarter (up 18% on the year), while hours jumped 31% on the quarter (up 12% on the year). Finally BBC London had a good quarter, increasing 26% in reach on the quarter (and 60% on the year), while hours were up 59% on the quarter (and 99% on the year). It has to be said that BBC London’s figures have been all over the place in recent quarters, hence some of those gains. But reach is in line with recent quarters even if hours seem remarkably high. Overall those BBC London figures contributed towards a better quarter for the BBC in London than commercial radio. While commercial radio is still ahead of the BBC with 50.3% listening in the capital, it has fallen back from 54.7% last quarter. However it’s still better for commercial than a year ago when the BBC had a rare victory in London. Source: RAJAR/Ipsos MORI/RSMB, period ending 18 December 2017, Adults 15+. * The day RAJAR comes out probably isn’t the best time to go for a meal and still leave yourself time to write up what’s happening!